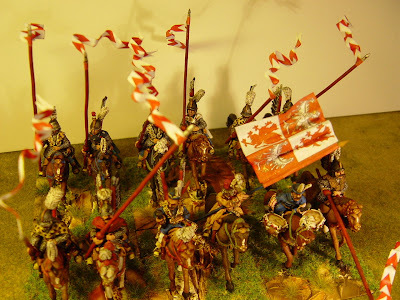 It’s been quite a while since I painted any units for my Eastern Renaissance armies (do you recall? – I planned on smallish Polish and Russian armies for the Deluge period, ie middle 17th century). Well, it is time to ‘surge’ ahead with the Poles. I plan on two cavalry wings of 60 figures each and a smaller infantry centre, which may, or may not even appear on some battlefields. A total of 14 units. 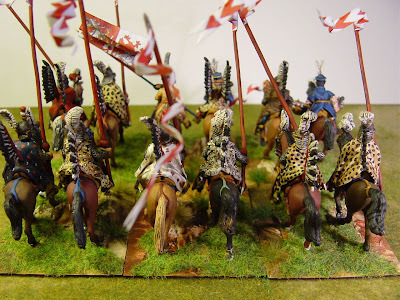 Starting with the right flank cavalry, we have here Duke Janusz of Masovia’s Hussaria Banner or Polish winged hussars. 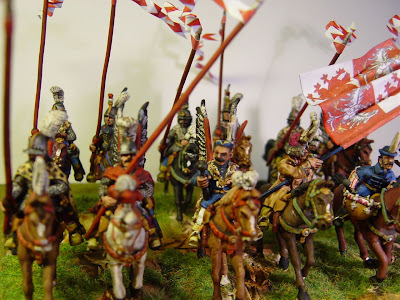 Quite who Duke Janusz was I have no idea, but he had a very pretty flag so he gets the honour of both commanding the right flank cavalry and having his own hussaria present. These are lovely TAG figures (The Assault Group) and although most have only one ‘wing’ I gave some two by pinching them from musicians. I was unaware that TAG sell extra sets of wings so when I come to paint the hussaria unit for the left flank I’ll buy the extra sets to give each figure a double set of feather wings. The command, by the way, comes without a standard bearer so I’ve cut the trumpet away from the trumpeter and given him the standard and ‘greenstuffed’ a new hand. 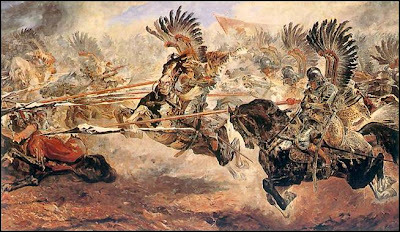 Wiki says:”The hussars represented the heavy cavalry of Poland. The heavy cavalry were known as Towarzysz husarski and the medium cavalry Towarzysz pancerny*. 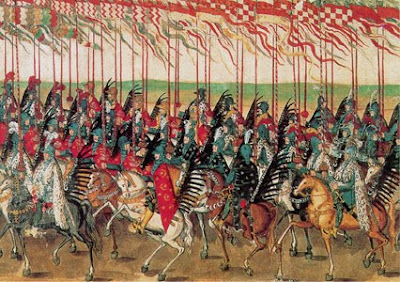 The Polish-Lithuanian hussars' primary battle tactic was the charge. They carried the charge to, and through the enemy. This was a key to their victories. They also tended to repeat the charge several times until the enemy formation broke (they had supply wagons with spare lances). The charging attack, and heavy weight of their armour and horses guaranteed victory for nearly two centuries. The hussars fought with a long lance, a koncerz (stabbing sword), a szabla (sabre), 1 or 2 pistols, and often with a carbine or arquebus, known in Polish as a bandolet. The lighter Turkish—style saddle allowed for more armour to be used by both the horses and the warriors. Moreover, the horses were bred to be able to run very fast with a heavy load and to recover quickly (Half Arabian horses). 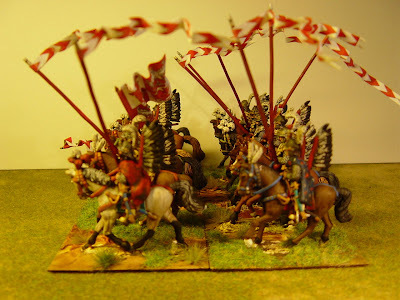 Polish Hussars were also famous for the huge 'wings' worn on their backs or attached to the saddles of their horses. The wings were made of a wooden frame and, most commonly, eagle feathers, although ostrich feathers were also worn. There are several theories to explain their meaning. According to some they were designed to foil attacks by Tartar lassos; another theory has it that the vibrating of feathers attached to the wings during the charge made a strange sound that frightened enemy horses. In 1970s those theories were however abolished. When an adaptation of “The Deluge”, a Polish historical novel was made, it revealed that the wings attached to the riders' back almost threw them out of their saddles when their horses went faster than a trot (when attached to the saddle they slowed down the horse greatly). Most probably the wings were used only for parades and other special occasions, but probably never in battle. 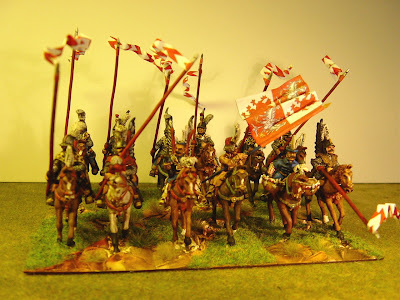 The hussars were arranged into formations known as kopia, which was also the word for the lances used by the hussars. The lance was the main weapon of the hussar. 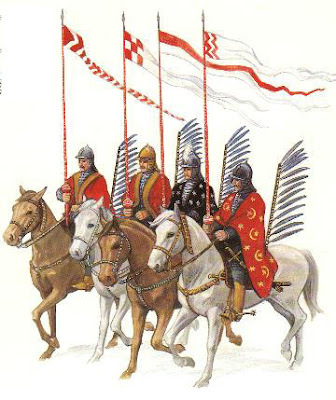 The lances were based on the Hungarian lance except the Polish lances were longer. They were commonly made from fir-wood, with the lance point being steel. They had a large wooden ball which served as the handle guard. The hussar's lance usually ranged from 4.5 to 5.5. meters. The kopia was adapted over time and eventually made to be hollow as to be lighter. * I have two units of “pancerny” to paint up very soon. Absoultely beautiful, thank you for sharing. Do you subscribe to the notion that the Poles would "paint" their horses? I've got the first 48 TAG Husars for my army and just didn't want to foul up the horses. I oil rub my horses and putting a "paint job" on top of the horse finish just doesn't make my day. Arrgh...another request...sorry...may I link your blog to my blog? I'll send you the link to mine so you may see if it would be ok. I'm just old fashioned and like to ask permission of authors before citing them. Comes with being an old history teacher! Where did you get your flags and banners? I really like your guys! What type of camera did you use to take the photographs? I have some TAG hussars waiting to paint, as soon as I do some kuirassiers. I am planning to use Perry pikes (steel) to avoid breakage and was thinking about buying some small beads as the hand-guard/ counterweight for the lances. I could drill the beads out to fit the lances. Where did you get your info re the problems with the wings?